Whether you have one kid or many, and no matter their age, you can benefit from reading Matthew’s tips for parents below. The articles may be downloaded to share for free, but all commercial rights are reserved. If you would like your child’s school to invite Matthew to speak, please just ask who takes such suggestions. Depending on the school, the person to contact may be the principal, librarian, assembly coordinator, leader of the Home and School Club, etc. P.S. I do speaking events at schools and reading conferences. 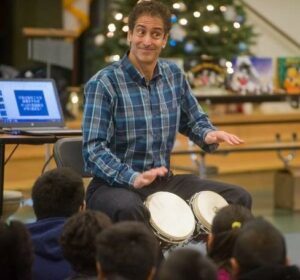 I play drums, share learning tips and tell stories in 4 languages: English, Spanish, Japanese and jazz! Assemblies for grades K-6th and bilingual Family Reading Nights in English and Spanish! This spring I have events planned for New York, Boston, San Diego, Texas, the Central Valley in California, and, of course, the Bay Area where I live. To “piggyback” or for information about visiting your locale, please send me a note to mg@matthewgollub.com. For information about Matthew’s author assemblies and bilingual family literacy events, please contact Matthew here, or call him toll free at (866) 4 TORTUGA.